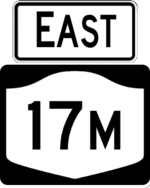 NY 17, as of 2012, is the longest route in New York, with the freeway sections composed of the Southern Tier Expressway and the Quickway. 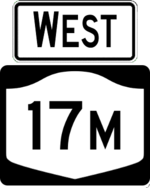 The freeway starts at I-90 in Pennsylvania and ends at the Thruway in Harriman; NY 17 once ran from Westfield to its present terminus at the New Jersey state border. The freeway is in the process of being upgraded to I-86; signs are currently posted for I-86 on a couple segments, and regions 5 and 6 are phasing out the NY 17 signs. 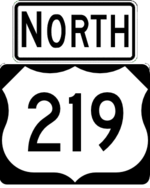 It is believed that NY 17 will be truncated to Harriman when the I-86 is completed. 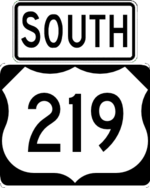 Rochester Exit number not posted. I-86 has not been officially designated and the shields are covered up.